Hi Everyone! It's Janet from SugarShine Designs here to help get you through Hump Day! If you feel like you could use some words of encouragement then you're in the right place. My project is a set of clean and simple cards featuring some of the 35 available dies in May's Expressions Plus word release. When I saw these dies, I immediately knew I would use the negative space of the words as windows for shaker boxes. In the video I show the traditional shaker box created by making a well for the shaker confetti with foam tape and covering it with an acetate window. The second method uses tulle to create both the window and the pocket to hold the shaker confetti. I'm a big fan of using tulle! It's much quicker, doesn't add additional bulk to your card and doesn't allow the shaker bits to gather at the bottom of the window. The size of the new Expressions Plus dies worked perfectly for either shaker method. If you'd like to see more of the Expressions Plus die release, click on the YouTube video link below. See how these new dies compare to the older Expressions dies, ideas on using the two styles together and other thoughts to jump start your crafting imagination. 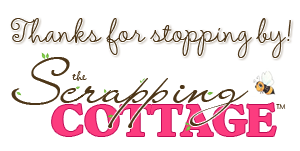 Thanks for spending some of your valuable time here at the Scrapping Cottage. Have a wonderful Wednesday! Shaker cards are always fun! I've never used the tulle; but, after watching your video, I may have to give it a try. Lots of pretty cards today, Janet! Wonderful video and great ideas! Your card are so pretty! So fun and beautiful are these cards! Janet, I love shaker cards, and you made some great ones with the script dies. I had never thought of using tulle for a shaker card! Thanks so much for the idea!!! Great video, Janet! Such a creative way to use expression dies!